The best apples are the ones you ate as a child. I mean the ones your mother tossed to you underhand as a favorite ritual every time she gave you one, and the ones you knew, every time, that you would catch. I mean the ones that crunched as your 10,000 taste buds perked up simultaneously, sending a rush of juicy tartness to the brain. I mean the ones that were so good that your jaw muscles would instinctively hyper-extend like a shark, and that shiny red (or green, or gold!) beauty -- probably larger than Mike Tyson's fist -- would be gone in seconds. That's what your childhood was like, right? Apples are perfect, no matter how you like them, but perhaps you don't know much about this all-American food. I'm here to answer a few questions about the finest fruit in the world, plus give a few reasons for their perfection that have nothing to do with my mother (who still throws me apples underhand when I visit home). Let's start with the basics. A medium-sized apple, about 3 inches in diameter, carries about 95 calories. They can vary based on the size and variety of the apple, but the calorie-to-gram ratio is about 1:2. 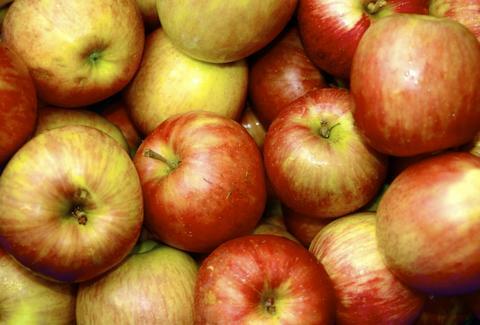 What are some health benefits of apples? Apples pack a real punch with all those calories, providing an excellent source of antioxidants, fiber, and flavonoids, as well as vitamins C, A, and several of the B vitamins. Eating them can help reduce cholesterol and lose weight, though "an apple a day keeps the doctor away" is an easily disproven schoolyard catchphrase. How many apple varieties are there? This is a tricky one. Unlike the humble, solitary banana, there are actually thousands and thousands of different types of apples in the world, from the popular American ones like the Red Delicious and the Stayman Winesap, to old Russian strains like the overly tart Antonovka. Of the hundreds available in the U.S., here are the 15 most popular. They account for 90% of the apples sold here. But Granny Smiths are unequivocally the best, and I will fight you over it. Can you give me a really good apple pie recipe? While I cannot speak to the health benefits of either of these concoctions, this recipe for Fireball Whiskey apple pie pastries will satisfy just about any party guest. If that's somehow not enough, we also have a recipe for apple pie nachos, which you should absolutely bring to a Super Bowl party. If you take mental health into account when seeking out apple pie recipes (and reader, I believe you should) both of these recipes are extremely healthy. Can you teach me how to make homemade applesauce? 1. Peel, quarter, and core your apples, and toss them with the apple and lemon juice in a giant pot. Bring to a boil. 2. Dial the heat down and simmer for about 15 minutes, or until your apples soften. 4. Zap the mixture in a food processor or blender, and either enjoy it fresh, or let it cool before storing it in the refrigerator. Ed. note: Applesauce is a great, healthy substitute for oil to use in baking, by the way. What's the best way to store apples? Two key tips to keep in mind on this one. 1. The best place to store apples is in the fridge. In temperatures colder than 30 degrees Fahrenheit, the apples will freeze, their cell walls will break down, and once you thaw them, they will have turned to mush. Don't let that happen. 2. Don't store them alongside rotting or bruised apples. Because apples are one of many fruits that emit relatively high amounts ethylene gas when ripening, proximity to them will hasten the ripening of fruit around them. So that's all great, but where did "How do you like them apples?" come from? This apple-centric and now-classic Matt Damon zinger originated in the early 1900s, per this terrific Quora analysis from a user named JG McLean. McLean references the commonly understood explanation -- of using the phrase as a World War I taunt at the enemy while lobbing grenades at them -- but breaks down why that might not be a perfect origin using n-gram linguistic analysis. The whole thing is a distracting read if you're into language and historical documents, but McLean lands on this theory: "It was regional or family slang pre-WWI; during the two wars its usage was cross-pollinated among men from different regions and returned home after the conflicts; the resonance of the phrase along with a general rise in writing featuring more realistic, informal dialog spreads it further, and Good Will Hunting pushes it further into the modern vernacular." If I have any say in the matter, apples will be perfect until the end of time. Eric Vilas-Boas is a writer and editor at Thrillist and has loved apples since 1990. Follow him @e_vb_.